not sure where to start, shouldn't be hard but since I am worse than a newbie I don't even know where to start. MXM socket (PCIE, but for laptop GPU) has many pins, but only need PCB that connects to pins "12v, 5v, 3.3v & GRND" and output to a sata 15 pin power cable to power 12v hardware (laptop default sata is only 5v, but no 12v rail). I have included schematic diagram for MXM with which pins has 12v/5v/3.3v etc, either Sata 15 pin, or 4pin floppy will both work. please help me on how to design a pcb that can do this, or please direct me to someone who has knowledge about this, thank you! 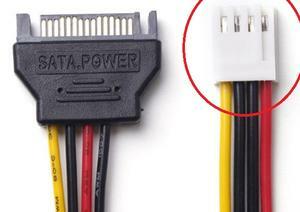 Floppy 4pin (red 5v, yellow 12v, 2x black are both ground), or Sata power 15 pin. this is a PCB image i have in my head would look like, but outputs 4pin floppy or sata power 15 pin. Is there even a 12 volt line in that MXM socket? 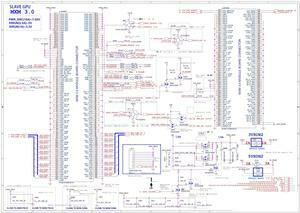 The schematic you provided mentions PWR_SRC, which can be between 7 and 20 volt. But no where suggests a fixed 12 volt. 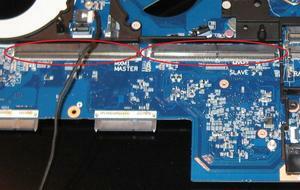 I suggest you look around on the laptop pcb for a different source of 12 volt. Those mxm connectors seem like a pain to solder to. Valen wrote: ↑Wed Jan 24, 2018 12:12 pm Is there even a 12 volt line in that MXM socket? The schematic you provided mentions PWR_SRC, which can be between 7 and 20 volt. But no where suggests a fixed 12 volt. I suggest you look around on the laptop pcb for a different source of 12 volt. Those mxm connectors seem like a pain to solder to. thank you for checking it for me, you are correct when i saw it theres only 5v, though I know GPU definitely using 12v because it is ultimately PCIE so it should be the same as desktop, these are especially desktop class notebook GPU capable of going over 175 to even 200w when overclocked. I was thinking PWR_SRC to act as 12v since voltage would be enough. 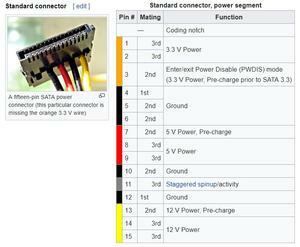 do you know how this would work to pull PWR SRC, GRND then 5v, GRND to 4pin floppy? If you insist on taking those voltages from that connector then I suggest you measure first if the desired voltage is on it. Get yourself a multimeter and probe the appropriate pins. There is no point in making something if you are not sure that it is going to work. I never even heard about this MXM connector. You're the first one to introduce it to me. Though I've disassembled my fair share of laptops, I've never noticed it. So I dare not suggest to claim knowledge of how it works. Or what happens if you do attach an additional load to it. You might be able to solder wires to it, but the laptop may fail to work when you power the additional hardware through that floppy power connector. Valen wrote: ↑Thu Jan 25, 2018 5:47 am If you insist on taking those voltages from that connector then I suggest you measure first if the desired voltage is on it. Get yourself a multimeter and probe the appropriate pins. There is no point in making something if you are not sure that it is going to work. this would be the only place im able to pull higher than 5v anywhere in the laptop so have to try. the cost of printing a few PCB $50-$100 is of no concern to me because if it work, it'll be great for many laptops with this MXM socket (usually only appears in high end laptops for upgradable GPUs). I understand there are risks and I think it is safe to do it, given in picture 5 someone already has done something similar but rather not to power storage but to power additional GPU which is more power hungry.